I can comment on the trail runs at least! I've started doing some trail running and WOW..it is tough. You have to be so totally focused mentally and that takes a lot of getting accustomed to. I volunteered at my first trail race and Ultra race this weekend and LOVED it!! These are crazy tough runners and I would love to be in that kind of company for sure :) Hope to be doing more trail running moving forward. Seriously, you've only been running for two years?! Wow. I had you pegged as being one of the long-time runners. You're awesome! you HAVE to try trail running!!!! and from one tall mom to another, its not as difficult as you would think. im 6ft and usually very clumsy, but actually pretty nimble on the trails (watch...now i will fall down next time i hit the trails). i try to trail run at least once a week, it really helps the burn out. also in trail running, walking is not frowned upon especially uphill, we call it "power hiking". because its so much tougher than road running, even the elites walk sometimes. get out and try it, its sooo fun and a million times even more addictive than road running!!!! I am LOVIING the framed race medal. How thoughtful & awesome!! I loved the medal I just received in Oregon [made from all recycled materials]. so sweet. I just convinced G to run an ultra in the spring with me (probably a non-trail one) ... want to join us? I think if I ever tackled an ultra, I'd want to stick to the roads as well. Some time in the very distant future. ;) For now, 26.2 (42.2 for us Canucks) is enough! I just purchased an Under Armor tank in turquoise on sale at Modells. It does not have a bra( I don't wear tanks like that), but it is long. I'm reading Born to Run, too. Loving it! Such a fun read. I like the Walmart Danskin tank tops for $7. They may not be long enough for you, though. You'd have to try them on. I like that little looster. 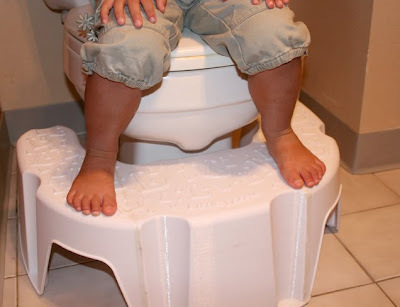 LBM could use that since he is trying to potty-train him self! It's a game to him right now. Trail running. I may train 99% of the time on the road (with tough hills in PA) but as far as racing goes I am stuck on trails. If I could do all my running on technical trails I would. It is simply everything I want out of running. Trail running is fun! You feel so much better the next day as long as you learn how to take the downhills and not hold back. I need to find a way to display my medals. Anything I think of is just going to be a clutter and take up way too much space. I have my first medal/bib framed as well. Awww! Tank Tops? I like Gracie's Gear ones... they are the ones with the front pockets. She was at the Seattle Expo! As for tanks, I have a twist tank from Athleta that I like and a tank from Target's Champion line that I really like also. Funny you mentioned tank tops... I'm planning a blog post for next week (I think)on my tank top addiction. I recently bought 2 UnderArmour tanks ($19.99 each) and will be reviewing them soon. One thing that I really like about them is that they are nice and long, so they don't ride up. I love my Nike Tank Tops. They are so incredibly thin! The ones I get don't have a bra top in them, but the thinness makes wearing one not a problem. Trail races are so much fun and so much of a challenge! I've only done a 10k distance in a trail race, but I'm looking forward to pushing farther. You should try it! I LOVE the marathon frame!! What a great idea. He should do that professional, it looks amazing!!! That step stool looks great! My little fella needs to work on potty learning too. Have you tried Kohls for tanks? Ultras are in my future :) Maybe distant but I am in love with the idea. Why not I suppose. I love underarmour tanks....the loose fit. I don't like my tops to be too clingy. They are light weight and relatively inexpensive. I love what Muscle Man gave you! I guess it does depend on how much space you have. Ask Emily to send you a pic of what she has done with her first marathons although again space will be an issue. What a beautiful gift your husband gave you - I would love to have something like that for whenever I do my first marathon as well! Thats stool is neat. My youngest is potty training. She taught herself how to bring the stool to the potty. Put the kiddie seat on then wipe and flush. But this only work if she's pants-less. She can't pull her pants down and prefers to pee in the pull up.